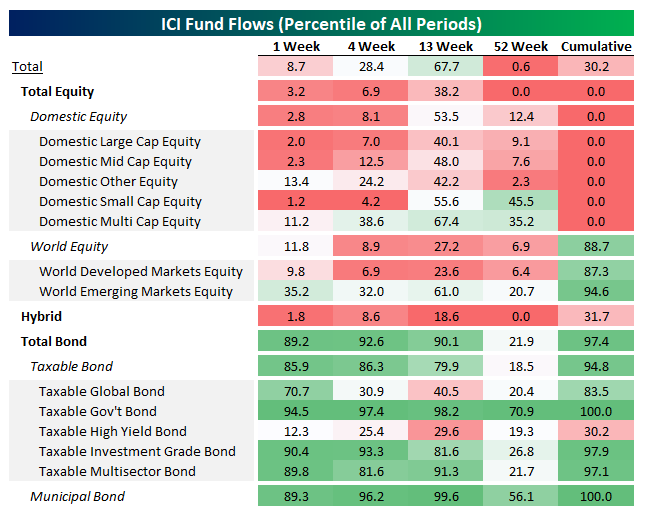 Yesterday the Investment Company Institute (ICI) reported its weekly tracker for flows into and out of mutual funds. In the table below, we show the size of fund flows as a percentile of all periods. As shown, flows for equity funds were brutal, with net flows smaller than 97.2% of prior periods for domestic equity funds in aggregate. Domestic large cap equity funds saw larger outflows than 98% of prior periods, while small cap mutual funds focused on domestic stocks saw outflows larger than 98.8% of prior periods. Despite negativity exhibited by equity mutual fund flows, the bond space has been thriving of late, with inflows to total bond funds better than 90% of all periods in the last three months, driven by taxable government bonds and municipal bonds. The most recent week saw very strong inflows to bond funds generally, mostly led by taxable government bonds but with a strong showing from investment grade credit, multisector bonds, and munis. Start a two-week free trial to Bespoke Institutional to receive our fund flow analysis on a weekly basis.